Yet the moon was 2 degrees above the horizon at its center. The edge appears jagged, the topography appears unfocused, this is not due to the camera, the same thing was observed through a telescope. The moon looked like it was segmented with multiple lines, similar to a faulty TV raster. Is this due to density layers? Is this what strong multiple refraction levels does to any object near the horizon? At any rate , the moon appears as if a river flows over it, some scientists attributed this to winds, it is doubtful that they were right. Im on standby for capturing the moon at EH2r levels, folding will be made clearer as the moon is not so bright and offers a chance to understand EH2r phenomenon more. A rare glimpse of a western moonset, November 12 21:20 UTC, moon center is 0.3 degrees above the horizon, shot captured from Sony digital 8 camera on "super nightshot". Great distortion of mid-lower to lower crescent showing very much the same behavior as with the sun, except you can see where the folding of light occurs. The mid crescent is brighter on account of the lower crescent pushing upwards into it. The lower part of the crescent is dramatically pushed upwards. 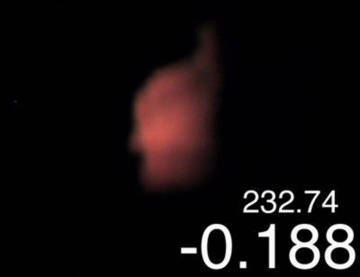 Subsequent video will take a better program to show details. Lower atmosphere had a 5º C inversion off the surface. Dec 20 2001, surface to inversion top lapse rate 0.01º C per meter, the inversion spans 14º C in temperature and 1238 meters in height. Remarkable pictures of the moon, despite its true astronomical position slightly above the horizon. First Video is a video capture from same Sony camera, it shows again the bending of the moon (0.5 degrees in space), with its upper half waxing crescent less distorted than below. The lower half on the second picture is really much smaller in height, as the huge crater in the middle of the picture is usually above the center axis of the moon when observed with less refraction. 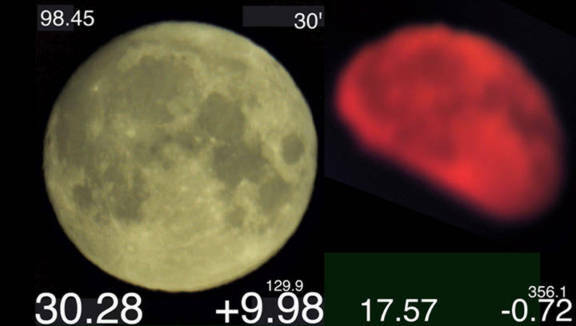 The second picture was not as good as visual observation, different elevation refraction layers caused the entire moon to look like it was pasted back together unevenly after cutting it up laterally. Streaming was not seen at that altitude. Streams were going from East to West some time later on. 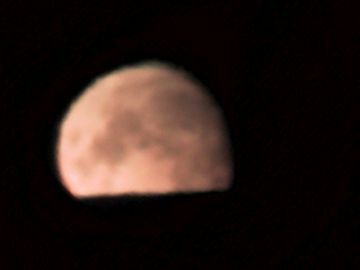 December 25 2002, moon series. Absolutely fascinating sequence showing the moon turning into a line while going through similar phases as with the sun. Except you can see the transformations a little better . 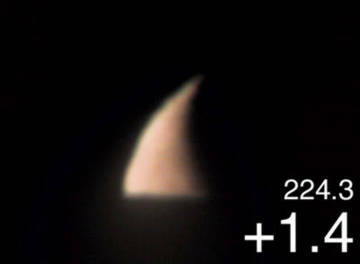 On top of a hill having a 2 degree horizon, the tip of a waning crescent shows itself as a rhino horn, note the thin green contour, there was significant refraction, a boost of 0.6 degrees despite the moon center being at 1.4 degrees above a true horizon, this was 25% greater then predicted by the Air Almanac. [3mj08021742] is the very same tip combined with the entire waning moon a few hours later, this zoomed shot compared well with the visual observation, reminiscing of Northern European standing Menhirs or in particular Megalith stones at Salisbury England. Lunar craters get boosted within a still distinguishable Waning Gibbous Moon. At right, January 20 2003 midnight moon craters appear to have moved a lot towards the moon's Northern Hemisphere. Again proof showing cold air refraction boosts are well beyond calculations provided by modern refraction models.